Their Inn was designed and built to be a Bed and Breakfast, so the five guest rooms are well-designed and completely separate from the owners quarters. 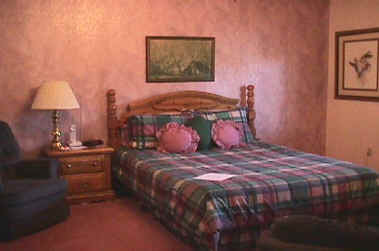 All rooms feature private bathroom (with Shower), TV, VCR, Queen-size bed, and telephone. The following room descriptions will give you some idea of how comfortable the Ashley will make you feel. The Evergreen: This second floor corner room features a cherry bedroom set with four-poster queen-size bed and two wing-back chairs. The color scheme is predominantly green, with accents of cranberry and deep rose. 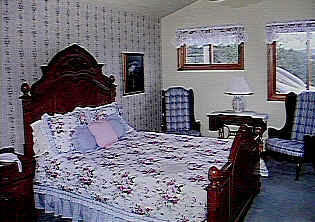 This second floor corner room features a cherry bedroom set with four-poster queen-size bed and two wing-back chairs. The color scheme is predominantly green, with accents of cranberry and deep rose. The Wedgewood: The blues in this room are both restful and peaceful. With its bold and beautiful tall carved oak queen-sized bed, antique dressers, and treadle sewing machine, this room is reminiscent of Grandma's room of long ago. The Amethyst: Enjoy stepping back into the past in this cozy and comfortable room, done in shades of amethyst and lavender. 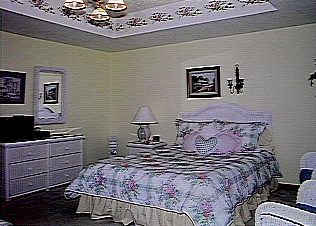 This room offers a lovely queen-size brass bed, antique dresser, dry sink night stands, and comfortable seating. Enjoy the inspiring view from this heartwarming room. The Rosewood: Located on the ground floor, this room offers easy access without stairs. With a heavy pine bed and matching dresser, swivel rockers, the room is highlighted by a brass chandelier. It is done in shades of green, rose, and burgundy, and is just off the dining room and close to the hot tub. The Gazebo: This wonderfully cheery room has white wicker furniture surrounded by tones of yellow, rose, blue, peach, and green. Its queen-size bed, private entry, deck with fire place and hot tub plus its privacy makes it a favorite of wedding nighters, honeymooners, anniversary celebrators. Their NEW 9x9 sauna (dry/steam), unique to the Ashley House and B&B's in the mountains is now available!